If using a grill, spray it with cooking spray and preheat it over a medium-high heat. Otherwise, wait to preheat a grill pan. Toast the walnuts in a small dry skillet over a medium heat, stirring frequently, until fragrant, 4-5 minutes. Allow to cool, then chop finely. Place 8 toothpicks in a dish of water and soak until ready to use. 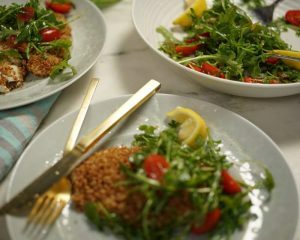 Sprinkle the salmon with ¼ teaspoon each salt and pepper, Wrap each salmon fillet with 1 piece of leaf and secure with 2 toothpicks. If using a grill pan, spray it with cooking spray and preheat it over medium-high heat. Brush each salmon bundle lightly with about 1 tablespoon total of the olive oil. 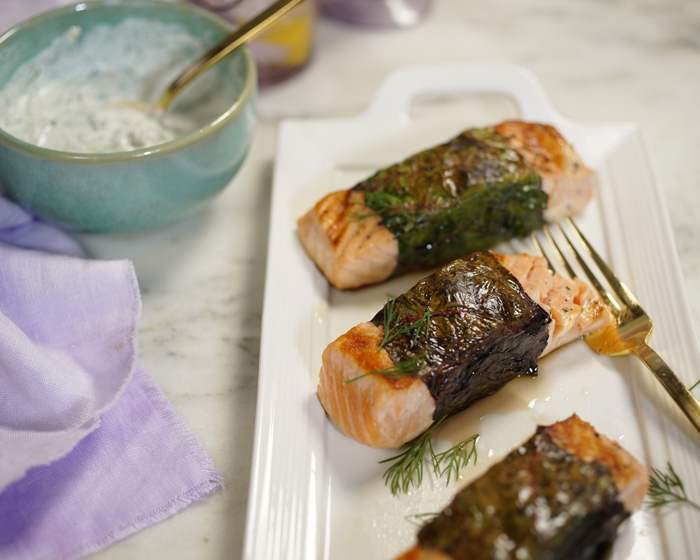 Grill the salmon bundles until the greens are tender and the salmon is just cooked through, 3-4 minutes per side. While salmon is cooking, make the sauce. Finely zest and then juice the lemon into a small bowl. Chop the dill and add it to the bowl along with the yogurt, walnuts, remaining 2 tablespoons of olive oil, and remaining ¼ teaspoon each salt and pepper. Serve the salmon drizzled with the sauce.